I have a pretty awesome job, in fact I’d go so far as saying it’s a dream job. Riding and racing, creating videos, taking photos, writing for magazines and websites and attending photoshoots are all components or a life that I feel very fortunate to live. Having had some horrendous jobs in the past (albeit in between some pretty cool ones) I take nothing for granted and thank my lucky stars daily. One of my biggest supporters is the Swiss clothing brand ASSOS, with whom I’m been working for several years now. Their clothing sits proudly at the very top of the pile when it comes to technology, style and progression and receiving a package of new garments is always a treat indeed. Attending their photoshoots is another pleasure – they work with the best photographers in knockout locations and always treat me well. 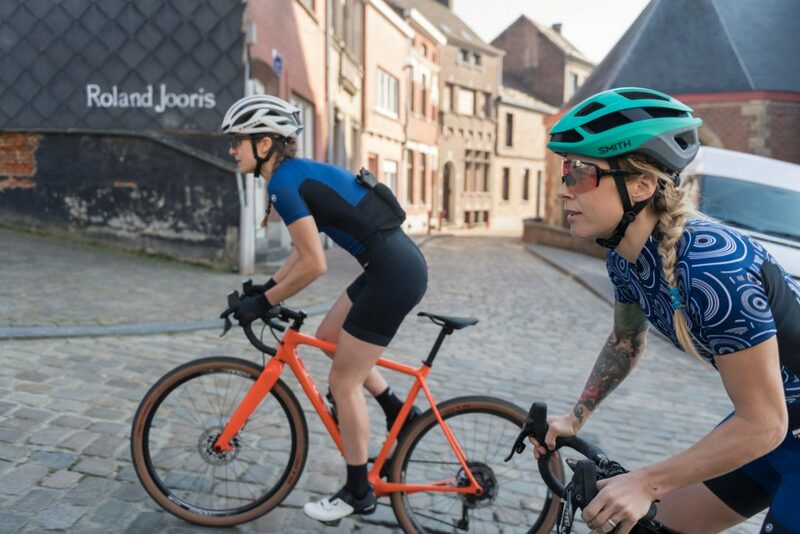 I just went out to Belgium to shoot some items from the ASSOS’ Laalalaai and UMA GT collections, taking a train to London before hopping on the Eurostar the following morning. My destination, Oudenaarde, at the heart of the Tour of Flanders is peppered with cycling history whichever way you look. It’s a cyclists dream with quiet roads and a positive and friendly attitude towards cyclists. 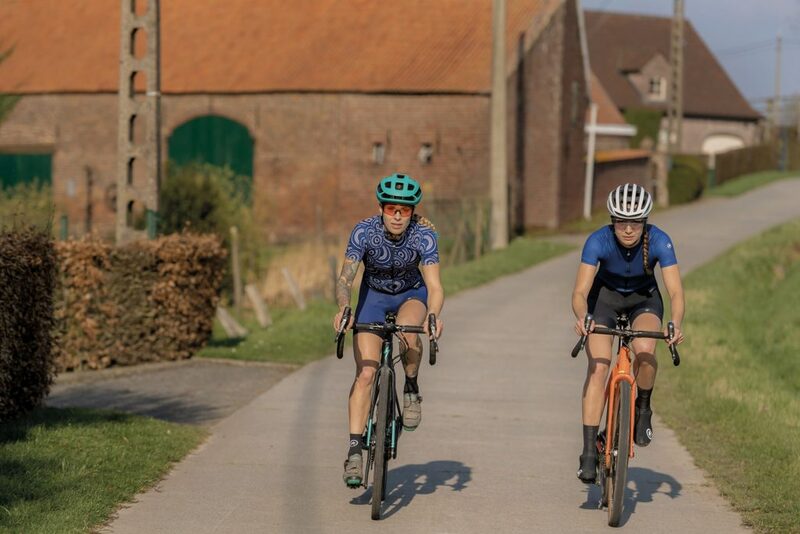 To those that don’t know it and think that Belgium is flat, hear this: the area is packed with short, sharp cobbled climbs made famous through over a century of racing. 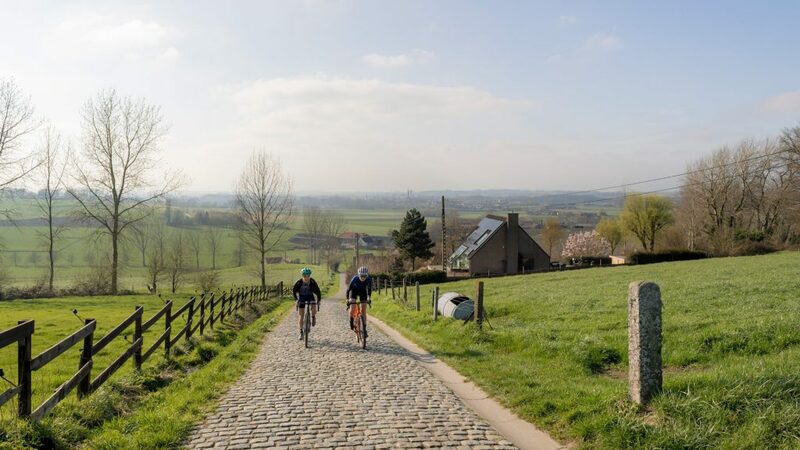 The climbs and cobbles test the limits of all who attempt them and are on every cyclist’s bucket list. I was whisked from the train station to a rather lovely café with amazing salads and vegetarian food by photographers Emmie and Phil, who knew both they and I would have a better afternoon fuelled up with quality food. From there, it was straight out on the bike where I was joined by Francie Arthur, a superfast and talented mountain biker whom I’d met previously whilst racing the Southern Enduro Series. A photographer, translator, producer and writer, Emmie is a world class trail runner (European Champion I believe) who could have gone pro. Fitter than fit, since getting more into cycling (due to various injuries) she’s become a formidable climber, managing to take pretty much all the QOM’s in her home area of Valtellina as well as any near the ASSOS HQ… or anywhere else for that matter. Phil, our other photographer is a former professional cyclist and keen runner himself. Being athletes themselves, they totally understood when I wrote to them before the shoot, expressing concern about whether we’d get any decent rides in over the three days I was shooting. I was ill for about a month in Feb (I lost my voice for ten whole days with Laryngitis!) and then had struggled to get back on track due to various work, travel and child related duties so I felt nervous about skipping anymore training sessions after such a poor start to the year. To ensure that I got to ride and they got good shots, Emmie had mapped out a route for us to ride taking in many of the best climbs in the area and some great gravel/dirt/off-road sections too; ideal for the Specialized Diverge Expert I’d brought along. I uploaded it to my bike computer – the plan was they’d just shoot us from the car or drive on ahead and set up shots for when we arrived, so pretty much all we needed to do was pedal. Someone had organised outstanding weather for us so I bared my legs for the first time of the year, donning one of my favourite kits, the blue paisley inspired Uma Camou jersey and navy UMA cycling shorts, something I wasn’t expecting to do in March in Belgium. It was my first time riding cobbled climbs and the bike performed well soaking up a fair amount of discomfort with its Future Shock. I’d opted for 37c WTB Nano tyres, the small tread giving decent grip on the loose, dry, gravel sections and some cushioning on the roads. From what I remember, the Paterberg was the first climb we hit and it was shortish and relatively punchy; as long as you kept your momentum the cobbles actually didn’t feel that bad as they were all relatively even and it was over before too long. I actually found a fairly flat but lengthy cobbled section later in our ride much worse – I think the body can only take so many cobbles at once. God only knows how people race this stuff after 200km in the saddle! After a pleasant few hours riding, shooting and testing our climbing legs, it was definitely time to indulge in one of Belgium’s other pleasures, beer, so we made for Oudenaarde’s main square and a bar with a suitably lengthy menu. Those of you who know me will know that I really love beer, particularly American style IPAs, German Weissbier and all manner of Belgian Blondes (plus more beside). Finding time to sample them all is never easy as I get drunk just by looking at a beer so I’d never actually tried Ename before. I can now confirm it’s very good! Rode some cobbles, drank some beer. Thank you Belgium and thank you @assosofswitzerland! To make my Belgian experience just that little bit sweeter, ASSOS delivered a real treat for me the following morning – a visit to local (and international) legend, Freddy Maerten’s home for coffee. For those that don’t know (presumably non-cyclists?) Freddy is a legendary cyclist who won World Championship titles, so many Tour de France stages that I’ve lost count, Classics races and the Vuelta a Espana. Cyclist’s like him don’t come two-a-penny; he was a great all-rounder who raced more than 200 days a year back when team buses and special duvets were unheard of. A true product of his environment and upbringing, Freddy still lives in Flanders, just around the corner from the owner of team Quikstep Floors as it happens. It was great chatting to him about growing up in Belgium, taking his first steps in racing and why the country has produced such notable talent. It was also great eating the exceptionally nice chocolates his wife Carine had laid out for us. As no one else was touching them felt like I should or we would appear rude. (I’m kidding. They were just really nice and I wanted to eat them). One of the more amusing stories Freddy told me was about the support, advice and discipline his parents had given him. Whilst a teenager, his Father forbade him from wasting precious time on women so when he said he was going training after school he’d give him the name of a police station somewhere and ask him to get a stamp from the Police Officers within, to prove he’d actually done the ride. After we’d ogled Freddy’s jerseys, medals and trinkets we shook hands, exchanged business cards and drove off into the sunshine as he and —— waved to us. After so much talk of cycling it was time for us to saddle up so we changed hastily into cycling gear and clambered aboard. 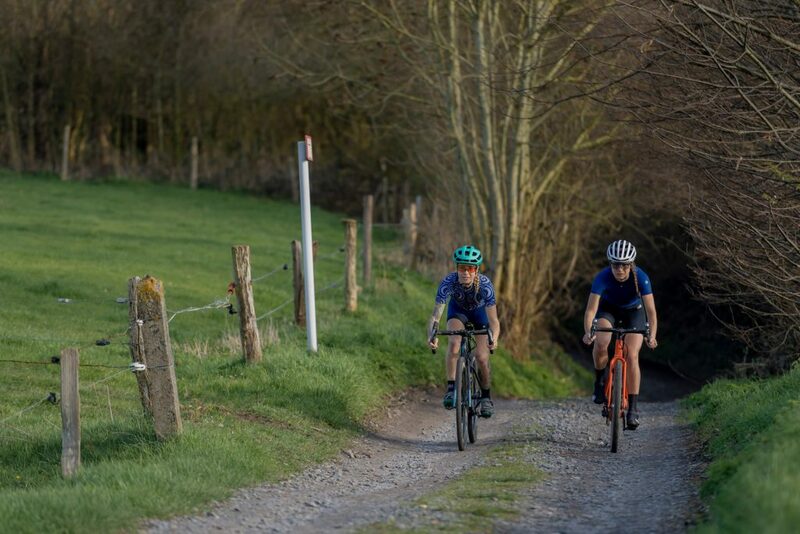 The area around Oudenaarde, aside from having those excellent and rightly famous cobbled climbs, is a real delight to ride as there’s a seemingly endless network of small lanes which see very little traffic. There are also miles and miles of smooth, easy-going bike paths that are well used and enjoyed by all ages. I saw many small farms on our journey, plenty with small lambs, kid goats and miniature ponies in paddocks close to the very well kept houses giving quite the bucolic impression. With sun on our faces we rolled past windmills, through small cobbled villages and up many of the bergs with churches perched on top. We saved one of the most famous for last. The Mur is a longish (by Belgian standards) climb that winds up the hill from Geraardsbergenwith a tough (steep and irregular) cobbled kick before the last segment. At the summit we were treated to incredible views and a feeling of breathlessness, hands shaken from the cobbles and legs weakened by our exertion. It was a fitting end to an incredible trip; Belgium had really delivered on climbs, scenery, weather and beer. I’ll be back for sure. Check out ASSOS’s story on our trip here and ask me any questions below!